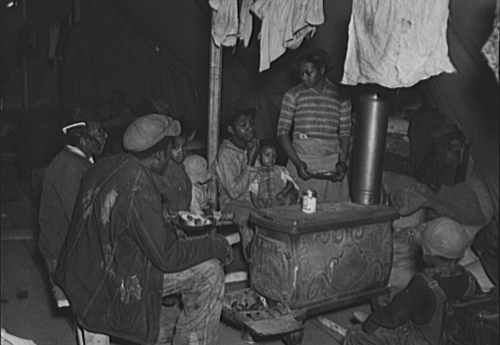 Russell Lee, flood refugees at meal time, Charleston, Missouri, February 1937. FSA-OWI Collection, Library of Congress, LC-USF34- 010215-D.
New Orleans Bear with me on this, because we’re going to take some twists and turns, but trust me, these things are all connected, and the water is always rising somewhere, so it matters. Partly of course we’re closing in on the 12th anniversary of Hurricane Katrina hitting New Orleans and the Gulf Coast. We’re still in recovery. There are still volunteers coming in from time to time to help. We’re still trying to develop the ACORN Farm in the Lower 9th Ward. There’s still a fight to stop expansion of the Industrial Canal that flooded the area and ACORN’s affiliate, A Community Voice, is still in the thick of the fight as it has been for the last dozen years. In Paris one evening during the ACORN International staff meeting we showed a clip from the upcoming documentary, The Organizer, that told the story of ACORN’s fight to rebuild New Orleans after the storm. I’m telling the truth when I share that there were some tears in the eyes of these hard bitten organizers. 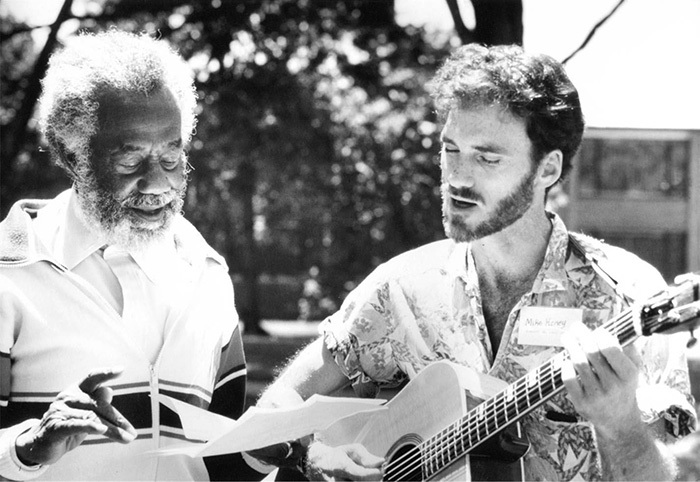 I was struck reading Michael Honey’s book and oral history on John Handcox and the Southern Tenant Farmers’ Union, Sharecroppers Troubadour, on the plane back to New Orleans from a too long 19-day trip to Hungary, France, and Italy. 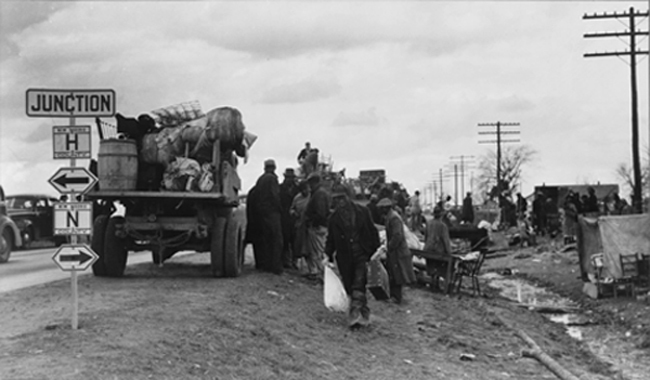 The STFU and Handcox had been organizing in the Bootheel section of southern Missouri which cuts into northeastern Arkansas when the Great Ohio and Mississippi River Valley Flood of 1937, “displaced 7,000 whites and 5,000 blacks, including nearly all of the STFU’s 250 paid members in nine Missouri locals.” Like Katrina the impoverishment was devastating, except if anything worse, because the country had not found an adequate response to its peoples’ disasters then either. These were farm workers whose crops were washed away, partially when the Corps of Engineers used 200 pounds of dynamite to blow up a levee to stop more flooding downriver. Like the ACORN Hurricane Katrina Survivors’ organizations in cities throughout the south and southwest footprint, as Honey notes, the STFU “organized an Official Council of the STFU Refugees, which excoriated the federal government for having caused ‘the most disastrous flood in the history of our country.’” There were too many coincidences. The little money promised came too late. The crops recovered, but the people did not. The STFU had to also be rebuilt in the area to fight again in a last gasp. John Handcox and Michael Honey, 1986. There was a story recently about the National Flood Insurance Fund in one of my daily papers, which grew out of these kinds of disasters. The fund is $25 billion in the red largely because of Katrina, Sandy in the New York-New Jersey area, and continued flooding in Louisiana from massive rains. The piece claimed that 30% of the money went to repeaters, folks whose homes just keep being flooded. A family in upstate New York was interviewed who were about to raise their house 10 feet with the insurance support. They couldn’t sell the house because of the floods. They wanted to retire and move to Arizona but they couldn’t. Poignantly, they said they knew they would be hit by another flood in the future. It was hard to not wonder, why the fund didn’t just help them get a new place? As climate change becomes a constant concern, all of this history and these simple questions are going to be harder and harder not to answer with a more constructive and humanitarian response.